With their oversized eyes they look like features that should belong to cartoon characters. But these stunning pictures show the strange faces of Britain's most colourful bugs that are normally far too small to see. The spectacular series was captured by amateur photographer 'Bugman' Eddie Nurcombe, 42, using powerful macro equipment. 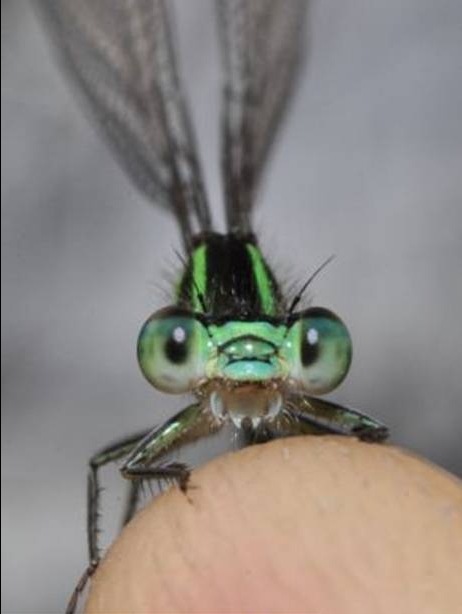 His amazing close-ups are like mug-shots for a variety of insects and spiders including damselflies, wasps and even a cute leafhopper. The astonishing level of detail gives a bugs'-eye view of a secret insect world - right under our noses. Patient Mr Nurcombe, from Nottingham, spent hundreds of hours on his hands and knees in his garden, local nature reserves and parks to get up close and personal with the country's creepy crawlies. Because of his love of the creatures, his friends have even nicknamed him 'Bugman'. He spotted a series of macro pictures online last year and fell in love with the art of nature and started photographing them himself. Mr Nurcombe added: 'It's seeing those details that people don't think about. We all walk around every day and we don't notice what's really around us. 'I love this photography because it brings out all that detail. It gives the insects a cartoon-like quality and almost seems to give them character'. It has been a long process of trial and error and Mr Nurcombe has invested a lot of money into his labour of love, but recently it has begun to really pay off. Balancing his time as a process technologist for chemists Boots, making plastic bottles, Mr Nurcombe loves spending as much time as possible out in the countryside to do what he loves. He often spends more than half an hour poised in one position - waiting to get the perfect shot. 'They're constantly moving,' he said. 'I usually use my own body to support the camera because a tripod doesn't give you the freedom of movement you need. He added: 'I don't go out in search of one particular thing.